NEW YORK — Forget bad weather, traffic jams and kids asking, “Are we there yet?” The real headache for many travelers is a quickly-growing list of hotel surcharges, even for items they never use. Guaranteeing two queen beds or one king bed will cost you, as will checking in early or checking out late. Don’t need the in-room safe? You’re likely still paying. And the overpriced can of soda may be the least of your issues with the hotel minibar. Vacationers are finding it harder to anticipate the true cost of their stay, especially because many of these charges vary from hotel to hotel, even within the same chain. “The airlines have done a really nice job of making hotel fees and surcharges seem reasonable,” says Bjorn Hanson, a professor at New York University’s hospitality school. This year, hotels will take in a record $2.25 billion in revenue from such add-ons, 6 percent more than in 2013 and nearly double that of a decade ago, according to a new study released Monday by Hanson. Nearly half of the increase can be attributed to new surcharges and hotels increasing the amounts of existing fees. Hanson says guests need to be “extra-attentive” to the fine print. Fewer and fewer services come for free. Need to check out by noon but don’t have a flight until after dinner? Hotels once stored luggage as a courtesy. Now, a growing number charge $1 or $2 per bag. Shipping something to the hotel in advance of your trip? There could be a fee for that too. The Hyatt Regency San Antonio, which subcontracts its business center to FedEx Office, charges $10 to $25 to receive a package, depending on weight. Convincing a front desk employee to waive a fee at check-out is getting harder. Fees are more established, better disclosed and hotel employees are now trained to politely say no. “It’s the most difficult it’s ever been to get a charge removed,” Hanson says. 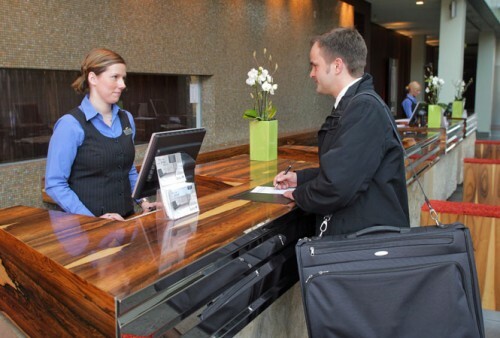 U.S. hotels last year took in $122.2 billion in room revenue, according to travel research company STR. Fees only add an extra 2 percent in revenue, but Hanson notes the majority of that money is pure profit. “You can walk into just about any coffee shop and have it for free,” Breckon says.